Session 5 – April 23, 2018 – UofU Osher – Earth Science Outside. Logistics are solid (April 22) and content should be finalized April 23. View from upper path of Warm Springs Park – AWolcott. Refineries in foreground. Antelope Island and Basin and Range in background. Tie evidence we see today to the geologic history of Salt Lake County. Sediments tell the history of present environments of deposition. Bedrock tells the history of the past. Specifically, sedimentary bedrock tells the history of past environments of deposition. NOTE: The building and its parking lot are located where 300 West (State Highway 89) turns northwest and becomes Beck Street. We meet on the northwest side of the building in the parking lot. NOTE: for those who use GPS, you’ll know you’re at the right place if you’re across the street from the Tesoro (Andeavor) gas station 965 N. Beck Street. I suggest you use that address in your GPS and know you’re across the street. BRING: your handout from Session 1 (Commander’s House) of the Geologic History of Salt Lake County shown as nine cross-sections. NOTE: 75% of this session we’ll be walking, talking, looking for fossils, admiring rocks, and moving slowly along a path. SAFETY FIRST. A known hazard is about a 10 foot stretch of sidewalk that sometimes is very slippery. Slime has grown across the sidewalk where the water from the springs keeps the sidewalk wet and it can be slippery. CAUTION! 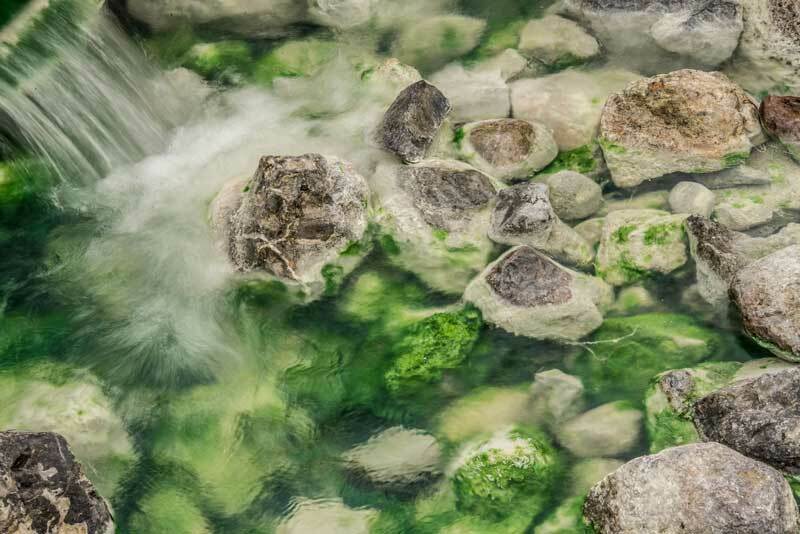 As for the Warm Springs, they are warm versus hot and do not pose the hazards of hot springs. NOTE: After our walk, we will set up lawn chairs. If you have a favorite, light, lawn chair it’s fine to bring it. NOTE: Safety first. ALL outdoor exercises have inherent safety concerns. Be prepared with sensible shoes, walking stick if desired, clothing appropriate for weather, etc. The path is not steep. We’ll take our time. SAFETY is a group endeavor. Speak up for safety! There’s never been an issue at this site, let’s keep it that way. Warm Springs Park has a few elements. 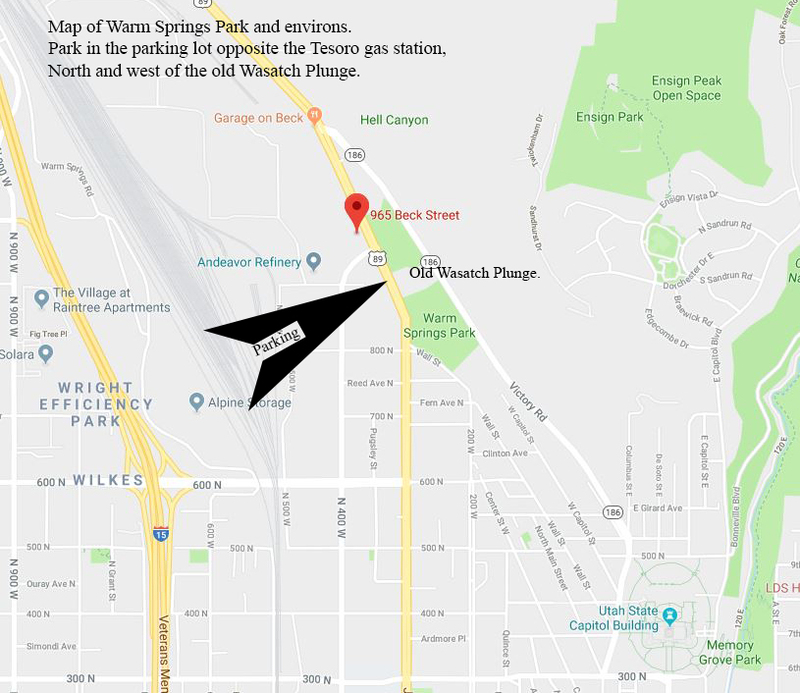 We’ll be next to the old Wasatch Plunge building along Beck Street. No alternate site will be posted until we know for sure bad weather. Weather looks good enough. If in doubt, check Sunday before class. 1:30 PM — Welcome and Practice Step One of Landscape Literacy… Breathe! and Be mindful of patterns. Warm Springs Park, View of the Salt Lake Salient. AWolcott, 2018. Admire patterns of Earth materials, specifically, patterns of sediments and patterns of bedrock. Repeat to remember, Remember to repeat: Five steps toward the JOY of landscape literacy. Today we practice all five steps. Step one: look around. Be mindful of patterns. Breathe deeply. Step two: Look deliberately at patterns of shapes of landforms. PATTERNS… Deliberate awareness of landform shapes. Deliberate awareness of cause and effect of TODAYs tectonic environment here along the Wasatch Front and TODAYs environments of deposition. Be mindful of crosscutting relationships, what cuts what, for example, does a stream channel cut the bedrock? Step three: Look deliberately at patterns of Earth materials, specifically sediment versus bedrock. Step four: Look deliberately at patterns of Earth materials and focus on patterns in bedrock. Be mindful of layering and patterns such as tilting or folding. Be mindful of crosscutting relationships, what cuts what, for example, are there surfaces within the bedrock that look like faults, or old erosional surfaces, or intrusions (not here)? Think about what you see as evidence of how the geology here evolved: Apply the three rules of relative age. Superposition: if a rock unit (sediments or bedrock) lie directly across another, the one below had to be there first and it is older than the one that lies across it. Cross-cutting relationships: if one feature cuts another, the one that is cut is older than that which cuts it. One has to have a cake before one has a slice of cake. Original horizontality: if a series of layered rock units started out approximately horizontal, and it they are now tilted, the tilting happened after they were there. Practice looking locally (within a 1000 ft), and then mid-field (a couple miles away), and then far field (several miles away). What do we notice about repeated patterns, or patterns that don’t repeat. 1:45 PM — Stop 1 of our walk: “Wall” of landscaping rocks and hillslope along the northeast edge of the parking lot. Fossils as clues to geologic history. Earth materials: bedrock versus sediments. Fossils. 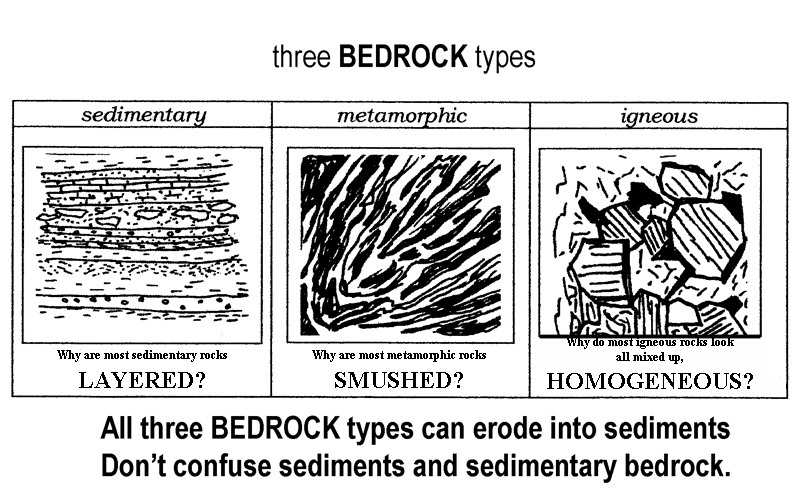 CONCEPTS… see below for more information: All sediments come from bedrock. It should be no surprise to you that the boulders along the parking lot might have evidence of what they were before they were put here. Meaning, these boulders come from the bedrock of the mine just north of here. That bedrock is sedimentary bedrock. All sedimentary bedrock once was sediments. The sedimentary bedrock of the mine was limy-mud sediments 300 million years ago and has fossils from then. (No wonder we call the rock cycle a cycle… from sediments… to sedimentary bedrock… and now sediments). 2 PM — Walk north to the pillars of the gazebos. Cobbles (melon-size beautifully rounded resistant rocks) as clues to geologic history. Earth materials: the cobbles that have been built into the pillars are sediment (loose … no longer firm, coherent, continuously attached to Earth’s crust). Where did they come from before they were placed in the pillars? Where did they come from before that? CONCEPTS… see below for more information: All sediments come from bedrock. These gorgeous cobbles (melon-sized pieces of sediment) tell the story of their present environment of deposition (put into the pillars by people); and the story of the present environment of deposition of the hillslope (ground failure from the brown bedrock on the skyline); and the brown bedrock would logically tell the history of what it was like even before now. 2:15 PM — Walk north following the sidewalk uphill (approximately 330 steps to reach 30 ft higher elevation). Layered bedrock as clues to geologic history. 2:30 PM — The warm springs of Warm Springs Park. Faulting as clue to geologic history. The warm springs are here because we are along an expression of the Wasatch Fault Zone. Water at depth (hot!) travels up the fault zone and is still warm where it surfaces. How can we tell that the faulting is younger than the bedrock we’ve studied uphill from here? 2:45 PM — Review what we’ve seen. Opportunity to sit. Brief review of the evidence we’ve witnessed today. Let’s put it together by relative age: what bedrock that we saw today is the oldest based on the three rules of relative age (superposition, cross-cutting, tilting)? LIST of at least a dozen sediments / bedrock / surfaces or whatever that you could put in order of their age. The age of the gray bedrock. The sediments those boulders were put on. Participants should take their time and relish Step 1 of Landscape Literacy: PATTERNS. Mindful moments. Participants should be comfortable asking themselves questions about relative age. Participants should be able to describe present-day environments of deposition for the sediments anywhere in Utah (note: SEDIMENTS… not necessarily sedimentary bedrock). Partici7pants should be able to recognize (pretty obvious) patterns of layered bedrock, specifically, layering and tilting of units. Participants should be pretty confident that they know the rules for “relative age” meaning younger than / older than. Participants should enjoy analyzing the relative age of rock units, but should not be over-confident in their abilities to “get it right.” They should understand the difference between competence in ordering rock units (geologists spend years practicing this) versus comprehension of the rules (the goal of this course). What is meant by “relative” age? What is bedrock versus sediment? Erosion, transport, and deposition result in sediments. Sediments are loose, having been eroded, transported and deposited by processes of the present. Sediments tell the history of the present. Bedrock is firm, coherent, continuously attached to Earth’s crust. Bedrock tells the history of the past. Sedimentary BEDROCK is one of the three types of BEDROCK (sedimentary bedrock, metamorphic bedrock, and igneous bedrock). 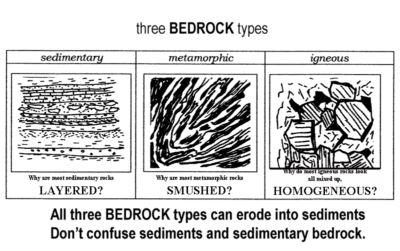 For purposes of landscape literacy… why must you not confuse SEDIMENTS with SEDIMENTARY BEDROCK? What evidence do you see? Step two: Look deliberately at shapes of landforms. Step three: Look deliberately at patterns of sediment versus bedrock. Step four: Focus on patterns in bedrock. Is there evidence of layering? What about crosscutting relationships or folding, or tilting of layers? Think about what you see. 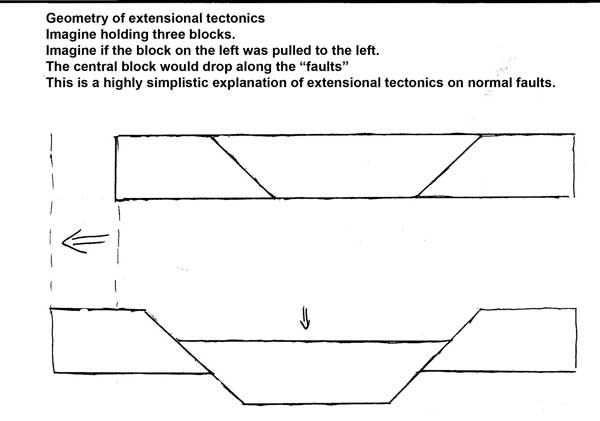 Content: Repeat to remember: Tectonics Rules!! Repeat to remember. Remember to repeat. What looks familiar, like these blocks of last time? Cause and effect: Was Salt Lake Valley here before the down-dropping along the fault zone? Scale: Imagine in your mind’s eye… how grandiose is this process and its effects? Was Mount Olympus “here” before the spreading of the Basin and Range (chapter 9 – Now! Stretching west)? Was Great Salt Lake “here” before the spreading of the Basin and Range (chapter 9 – Now! Stretching west)? Were the sediments in Salt Lake Valley collecting where they are now before the spreading of the Basin and Range (chapter 9 – Now! Stretching west). Was Parleys Canyon “here” before the spreading of the Basin and Range (chapter 9 – Now! Stretching west). Why did Parley’s Creek cut Parley’s Canyon? 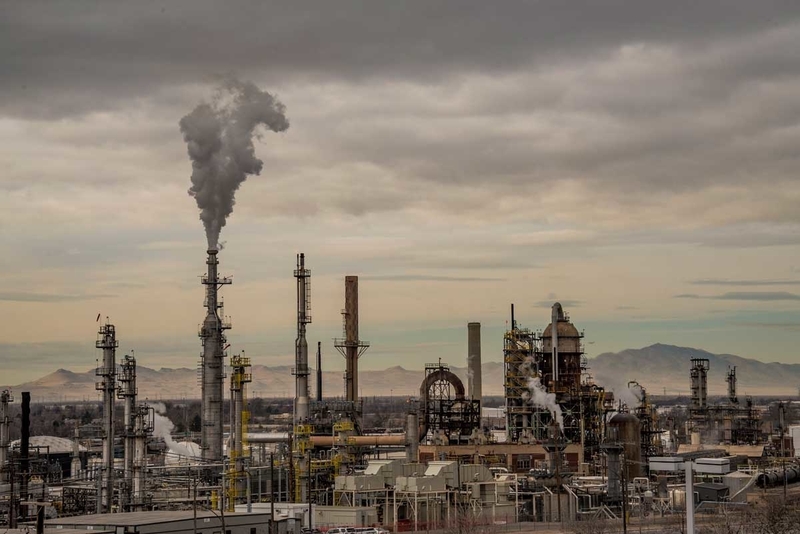 Content: Earth’s materials… Think of Earth as a recycling factory. Some circuits are “short” meaning, not too many steps. Some are longer. The Rock Cycle is a model of how Earth is a recycling factory of minerals. Minerals are the building blocks of rocks. Elements and compounds are the building blocks of minerals. Here’s how I think of the rock cycle: four processes, and four products. Content: Sediments tell the story of the present. They tell what processes left them where they are: wind? water? glacial ice? ground failure? or, now humans. Imagine: what do the rock materials in a stream look like? Can you imagine what the rocks in a big stream right in today’s Uinta Mountains looks like?Sediments become sedimentary bedrock. Sediments can become bedrock. They become sedimentary BEDROCK. Content: Sedimentary BEDROCK tells the story of the past. SEDIMENTS tell the story of the present. Why is it unwise to confuse sediments vs sedimentary bedrock? What evidence is there that the sediments in Salt Lake Valley, such as those of Warm Spring Park are the youngest, even younger than the youngest bedrock (brown along skyline)? Some of the sediments at Warm Springs Park are younger than the most recent faulting. Some of the sediments at Warm Springs Park are older than the most recent faulting. The brownish rocks along the skyline are younger than the gray rocks of the mine? The gray rocks of the mine were once in Earth’s crust when it was “scrunching” (compressional tectonics). The gray rocks of the mine are older than the Wasatch fault at Warm Springs Park. The Wasatch fault at Warm Springs Park is younger than the gray rocks. 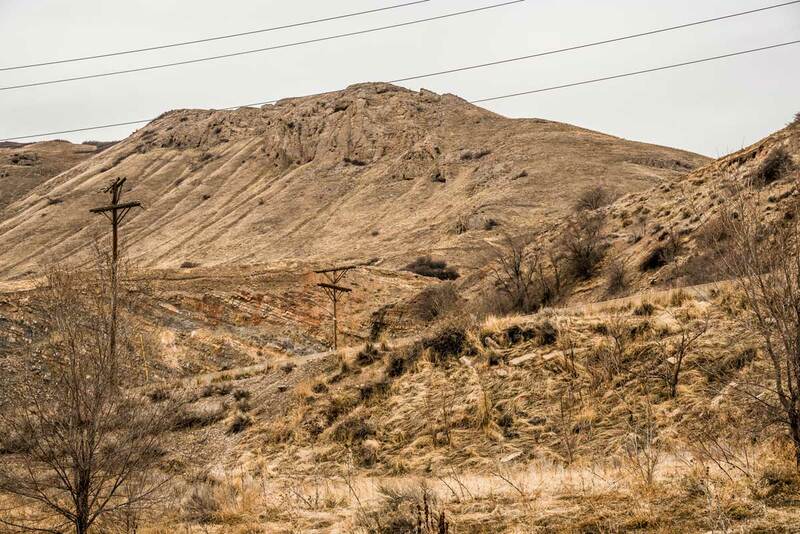 The Wasatch fault at Warm Springs Park is younger than the brown rocks of the skyline. So did the tilting of the gray rock units happened long before the Wasatch Range was exposed? Participants should not yet be confident in their skills to read patterns of rock units or how to put the rock units in order. However, participants should recognize how geologists figure out series of rock units such as at Warm Springs Park. 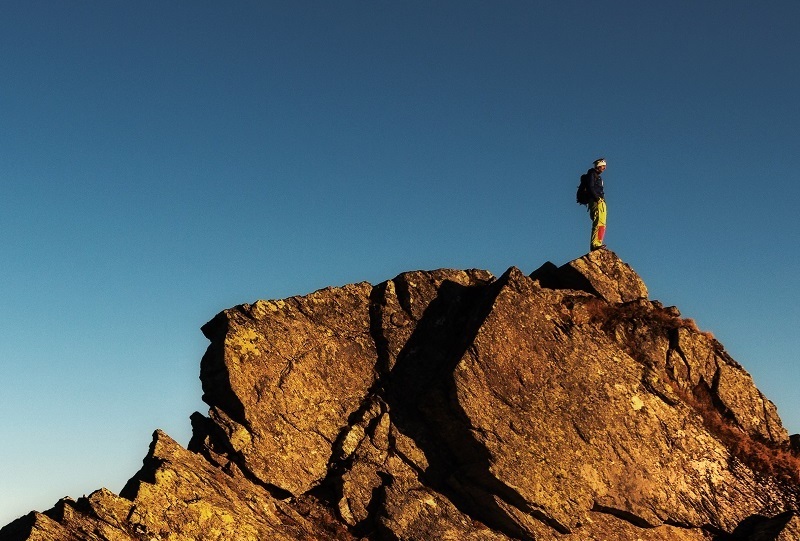 Participants should take joy in recognizing that landforms (the natural features on Earth’s surface) are younger than the bedrock that makes them. Participants should realize that Utah’s Chapter 9 – Now stretch to the west is the chapter of the present tectonics that has resulted in the basins and ranges of the Basin and Range province and, specifically our bold beautiful Wasatch Front. Participants should realize that Utah in the past did not look like Utah today. Sediments of today record the environments of today. Sedimentary bedrock once was sediments of the past and records the environments back then. Next session… our final session, Session 6. No homework. Just breathe! and be mindful of the Earth science that surrounds you.